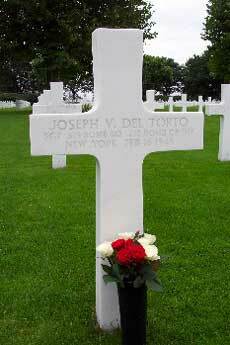 Joseph V. Del Torto was born in 1925 in Poughkeepsie ( Dutches ) New York. 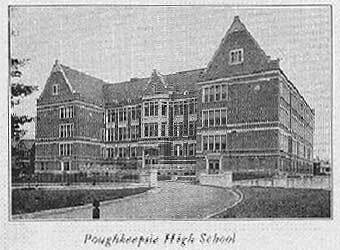 He graduated from the Poughkeepsie High school in 1943 where he played on the football team and was a member of the cheer-leader squad. Also he was a member of St Peter`s Boy Scout troop and the Holy society of Mt. Carmel Church. Cheer Leader 1. 2; Football 2. 3. 4. Quiet Joe with a pleasant grin is sure some pretty girl to win. 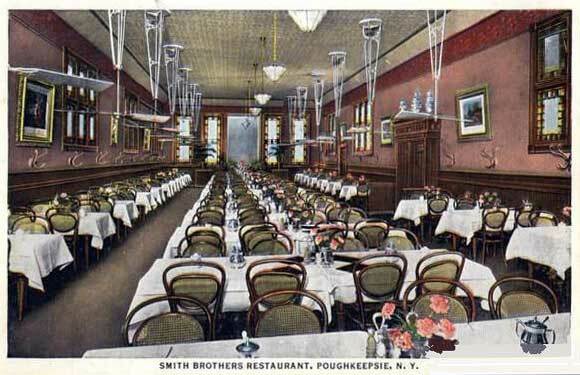 Before entering the service he was an employee at Smith brothers restaurant in Poughkeepsie. 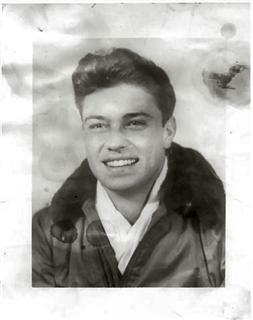 Joseph enlisted in the air corps in July, 1943. He received his training at Colby college Nashville. Tennessee and Uma, Arizona before going overseas in January, 1945. Thats how he got to the RAF airport in Deenethorpe, England. He was 19 years old. RAF Deenethorpe was located about 75 miles north of London in Northampton Shire. 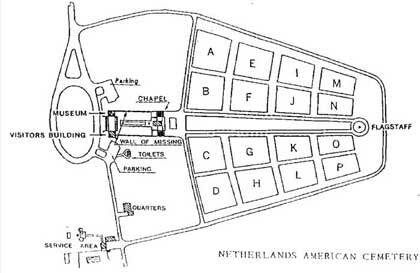 The airport first got in action in 1943 and was listed as USAAF Station 128. 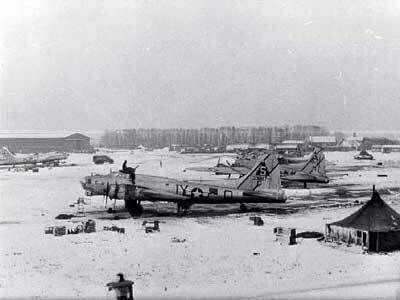 They flew 255 missions and lost 95 B-17`s between December,1943 and June,1945. He flew with the crew of 1st LT Hansen in the 615th Bomb Squadron as an Radio-operator. 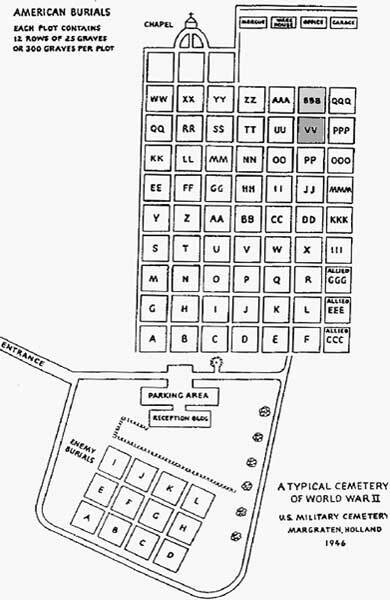 Joseph's task on board of the Maid to Order was , Radio Operator. Joseph had a very imported task in the plane. He had to learn morse codes to do his job. 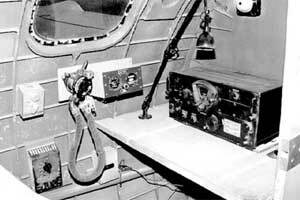 Another function of the radio operator was to receive a radio fix for the navigator. 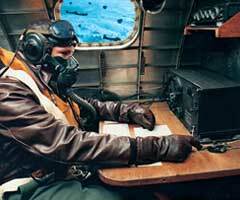 But he couldn't use the radio when the mission was started , afraid of the Germans who where listening every frequency. 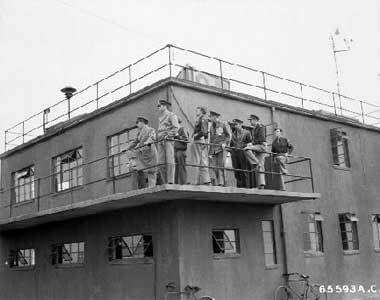 The radio operator was also trained as a gunner and as the first aid man of the crew. Josephs first flight was on Feb 16, 1945. 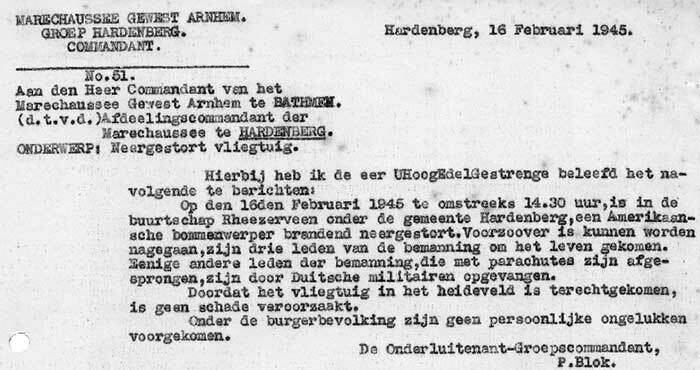 He had to replace the radio operator ( Ferguson ) because he was ill. Mission that day was to bomb the oil plant and railroads in Gelsenkirchen. 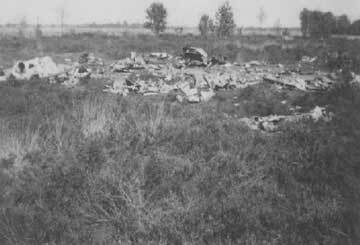 The plane was hit at the wing by German flak. On their way back to Deenethorpe the plane lost feul and the wing caught on fire. The plane was hading to the IJsselmeer and the pilot decided to turn 180°, the crew members jumped out of the plane and landed in Dedemsvaart. The fire spreaded rapidly. The crew had to leave the plane. Three of the nine crewmen didn't made it. Brunson and Del Torto couldn't leave the plane on time. 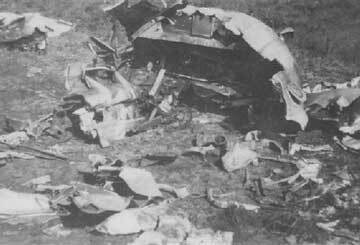 The pilot Hansen did jump but his parachute was hit by burning wreckage. You can read everything about the mission and the fatal end by clicking the next links. Read the Missing Air Crew Reports and the eye witness reports. Imagine this, 12 year old boys walking to school and seeing a German soldier in front of the school. The school was closed, no entry he said. Normally the walk home took about an Hour, but now , knowing we where free, i did it in half an hour. For us boys it was a wonderful time, the whole day playing and making a campfire. That was what Redder did that day whit his friends on Feb 16, 1945. I remember looking at the skies, there was a lot of flying that day, and we didn't paid attention to it. Suddenly I saw some smoke, but it where parachutes coming down. Then we saw a plane come down. The engines made a enormous sound. The plane crashed at the Colenbrander Forrest. A big bang, dust clouds, and then there was the smoke. I didn't hesitate, I had to go to it. The young Redder ran about 20 minutes to the wreckage. On his way he found a complete equipment and a backpack. They all took some things with them, a trouser and jacket. I found a book. At the wreck site everybody was taking things which they wanted to have, a piece from the guns and ammunition. When the Germans arrived I hided my book, but I never found it back. 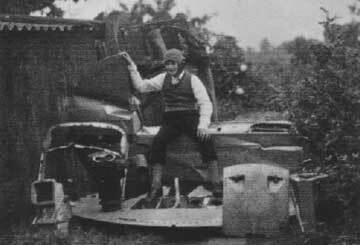 1946 Johan Redder, sitting on the wreckage from the "Maid to Order" behind his house. Sgt. Del Torto missing in action. 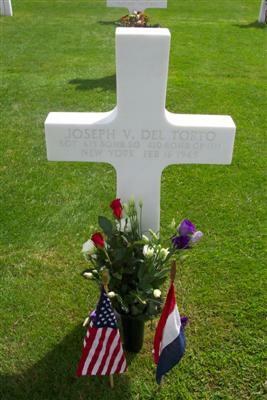 Mr. and Mrs. Tossel Del Torto, 30 Lent street, received word yesterday that their son, Sergeant Joseph Del Torto was missing in action over Germany since Feb 16. Further word will be forwarded as it is received, the War department telegram said. Serving with the Air corps as a radio-gunner, Del Torto enlisted in the Air corps in July, 1943. 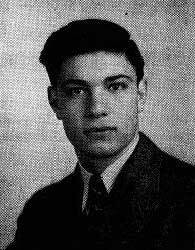 He is a graduate of St. Mary`s school and Poughkeepsie High school where he played on the football team and was a member of the cheer-leader squad. 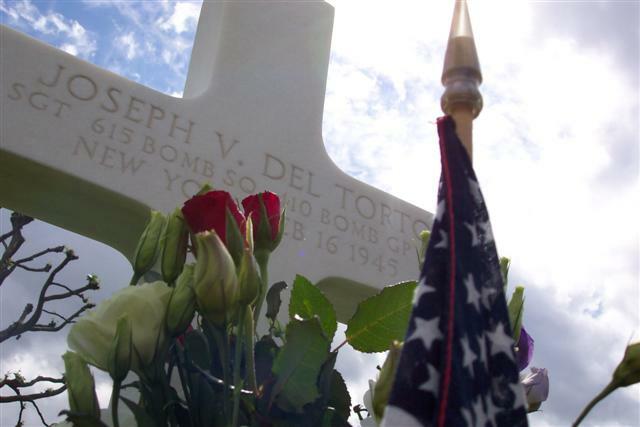 Joseph V. Del Torto and Wade T. Brunson were buried on Tuesday Feb, 20 on the cemetery of Hardenberg. They were reburied in Margraten on Nov 9, 1945. Wade on Plot VV - 265. 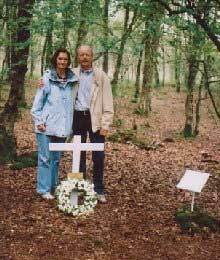 Ernest Hansen ( the pilot ) was buried in a honor grave in Achterveld. 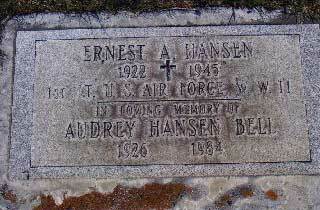 And was transported back home on Jan 29, 1949 and was reburied on Ocean View Cemetery in Eureka California. Plot: K , Row: 16 , Grave: 8. Because whit out his help these men would be forgotten and i would never have this story.